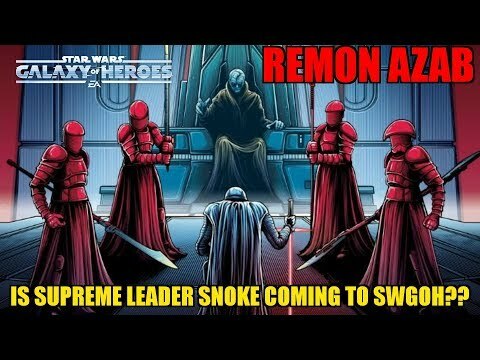 This video is my thoughts and speculation on when supreme leader snoke and the praetorian guards will be coming to the game. I hope you enjoy! Have a great day! And what would his abilities be? Look mean and speak rude? Duplicate himself for 1 turn? As long as Snoke doesnt get more background or stories told, he has no use in this game, for the same reason as Jar jar. Being in movies, but showing zero fighting skills is just not enough. On Wookiepedia there is a legends thing where it shows his abilities. If you scroll down in the comments, you can find Snoke's Kit. What kind of fighting skills does ugnaught have? Or Lobot? Snoke did the force lightning through the floor that hit Kylo. He used a mind probe on Rey. He used Force Choke. Your link shows multiple Praetorian Guards...? I doubt if they are to be added to the game we would get more than one, I mean we don't have multiple Royal Guards in the game, only one. We do not have a character in this game that uses force choke - could be a cool new power with a cool new debuff attached to it! Bonded: Does not count as buff/debuff, cannot be cleansed, dispelled. Bonded characters will always have the same percentage of HP and protection (scaling to the lower). If one would gain x buff for y turns, the other would too, applies to debuffs as well. Similarly, if one is damaged, the other would immediatedly lose HP. If one is killed, both will die. I think they should add a "collection" tab and you can achieve and unlock non-combat heroes. They can be trophies. Not every hero needs to dominate the arena. Jar Jar, C3po etc.. could be there. Holidays etc could result in free heroes, in holiday gear etc. Put some silliness in the game, we need to laugh more. not a bad idea, you can add certain characters to the cantina floor. like the titles, but a little more present. Um... doesn't Vader use it? He had telekinetic abilities. He threw Rey around quite a bit. And Jar Jar fought on Naboo and in the Clone Wars cartoon. He'd actually be hilarious. His kit could include stamping on a droid to make it fire at its friends. In the movies, sure, but in the game? Nope. Force Crush is something else.